At Curtain-Tracks.com one of our specialties is creating custom curtains for RVs, boats, and busses. This fills an important need because finding pre-made curtains that will fulfill the curtain needs in such vehicles is almost impossible. We have even found that corresponding windows on opposite sides of the same vehicle do not have identical measurements! 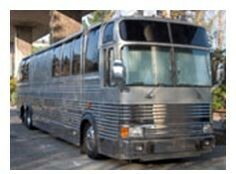 The only solution for customers who own vehicles such as large tour busses is to purchase custom bus curtains. This is not as pricey as it sounds. We offer many inexpensive custom curtain options that can address utility, style, and safety. Our custom bus curtains, tracks and drapery hardware are durable and high quality, and because these products are made for this kind of application, they will not suffer wear from being used inappropriately. We can provide custom windshield wrap-around curtains, which will keep out the light during the day and provide privacy at night. Window curtains, divider curtains, and bunk curtains are also all in our wheelhouse. We can even sew the carriers directly into the curtain panel if this is your preference. You can send us the fabric you like, or you can use ours. We carry flame retardant fabrics including those that meet FMVSS 302 standards, and offer Eclipse fabric blackout curtains. We can craft curtain panels to be compatible with almost any existing track and drapery hardware. No matter what fabric you decide to use, careful measurements are very important. When measuring width, we will need to know the full length of the track, and remember to measure each window or area separately – they will not always be the same! We will add the width needed to account for curtain fullness. Curtain height should be measured from the bottom of the track to where you want the curtain to fall. Measuring old curtains for reference is a useful trick. Please give our customer service reps a call to discuss your custom bus curtain needs: 888-434-7444.